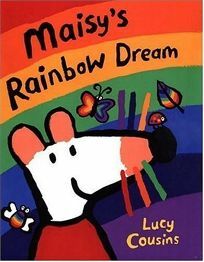 The oversize picture book (roughly 11"" 14"") Maisy's Rainbow Dream by Lucy Cousins takes children into a fantastical dream with all the colors of the rainbow. As Maisy dreams of a red ladybug, an orange fish and more, she invites her friends-and readers-to come along to see large, funny, dreamlike images, such as a green bus perched on the back of a golden snail or a fish with legs. The enormous trim can barely contain the exuberance of the cheerful mouse and bold rainbow colors.